After recording the latest in a string of quarterly losses, Virgin America has declared its intent to slow growth as part of a strategy to achieve profitability, which has eluded the carrier throughout its five-year existence. Earlier predictions by senior management of recording an operating profit for 2012 seem to be fading as Virgin America posted a USD53 million operating loss for 1H2012. The easing of its rapid growth could be a last-ditch effort to gain financial strength as patient investors wait for returns. Virgin America has only recorded a single quarter of profitability – 3Q2010 – when the carrier recorded net income of USD7.5 million. It recorded a USD100 million net loss in 2011, when the majority of its US carrier counterparts attained profitability as oil prices neared the record highs set in 2008. During 2Q2012, the carrier narrowed its operating loss to USD4 million from USD6 million the year prior, but its net loss widened by 46% to USD32 million. For 1H2012, Virgin America's net loss widened by 64% from USD66 million to USD108 million while its operating loss widened by 48% year-over-year from USD35 million to USD53 million. Coinciding with the widening losses, the airline’s cash balances decreased by 26% from USD111 million during 1Q2012 to USD82 million for 2Q2012. Despite a 3.5% increase in its average fare and a 1.7% rise in yields year-over-year for 2Q2012, Virgin America’s unit revenues slipped by 2% as the airline expanded its supply by 32% during the quarter (see Background information). As other US carriers continue to report record load factors, Virgin America saw its average loads during the quarter slip 3.2 ppts to 80% even as the number of passengers transported by the carrier increased by 25% year-over-year. 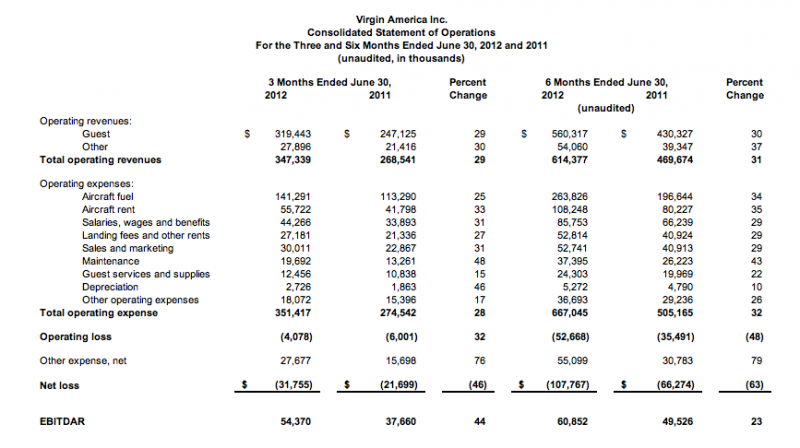 Virgin America’s average USD199.49 fare during 2Q2012 was USD39.51 higher than the USD159.98 average fare garnered by fellow hybrid carrier JetBlue. Despite a 1.5% drop in unit costs excluding fuel to USD6.49 cents, and a nearly 4% rise in average fares year-over-year, Virgin America still recorded a slip in unit revenues. JetBlue managed to record a 6% rise in passenger unit revenues to USD11.76 cents, while its unit costs crept up 5.6% year-over-year. While JetBlue is a much more mature carrier than Virgin America, at five years on JetBlue had completed an initial public offering and was producing operating profits. The 2007 launch of Virgin America did occur just prior to a spike in fuel prices to record highs and ahead of the worldwide economic downturn, but US carriers in general have accepted those scenarios as part of doing business, and have adjusted their business models accordingly. Virgin America has often said it is still a carrier in growth mode, and it seems its strategy to this point has been to trade building a critical mass for profitability. But that now appears to be changing. Noting the airline has increased capacity by 72% during the last two years (and touting an 11% unit revenue increase during that time), Virgin America management has declared it plans to accept delivery of just a single additional aircraft through 2Q2013. Presently, Virgin America operates 52 A320 family aircraft after taking delivery of 24 single-aisle jets since 1Q2010. The slowdown in deliveries follows a decision taken by Virgin America in Apr-2011 to defer a total of 13 deliveries of current generation Airbus narrowbodies. Six aircraft originally scheduled for the latter half of 2012 were deferred along with seven aircraft deliveries that were initially due in 2013. In Jan-2011 Virgin America placed an order for 30 current generation Airbus aircraft scheduled for delivery from 2013 to 2016, and for 30 A320neos for delivery beginning in 2016. Remarking that Virgin America has now completed two years of record expansion, CEO David Cush concluded that now the airline aims to focus on maximising the value of its network rather than managing additional growth, and the slowdown in capacity expansion should “continue to provide improved financial results”. 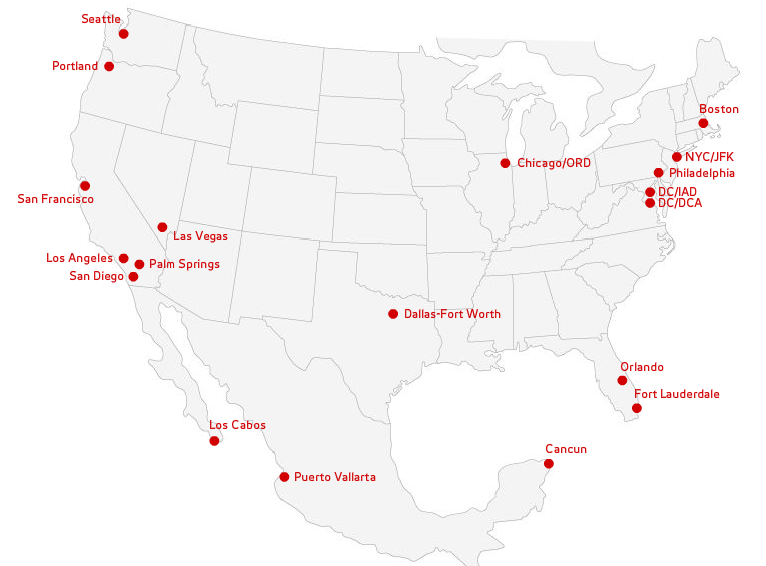 San Francisco-based Virgin America currently serves 16 US markets and three Mexican destinations – the leisure markets of Los Cabos, Puerto Vallarta and Cancun. The carrier offers flights to some of the largest US metropolitan markets including New York, Chicago, Boston and Dallas, as well as the well-travelled intra-California route of San Francisco-Los Angeles. 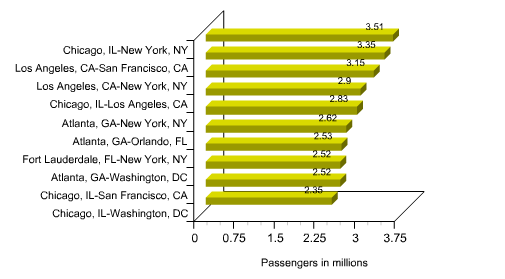 Two of Virgin America’s top 10 routes in terms of number of seats on offer – Los Angeles to San Francisco and New York – were listed as the second and third highest travelled routes in US Department of Transportation (DoT) rankings spanning Jun-2011 to Jun-2012. The carrier also serves Chicago from Los Angeles and Chicago, which were also among the highest travelled markets included in the DoT ranking. 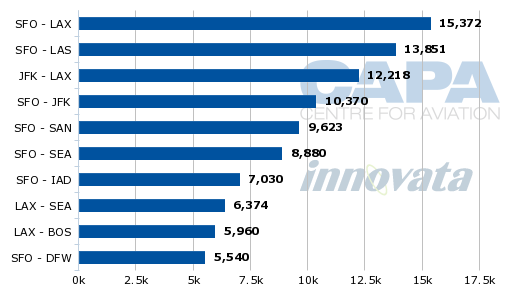 Current schedules in Innovata (23-Sep-2012 to 29-Sep-2012) show that Virgin America is not the largest carrier on any of its top 10 routes. While Virgin America’s fares are generally lower than large network carriers, it does charge a premium to other low-cost or hybrid carriers. But unlike the no-frills, ultra low-cost model adhered to by Spirit Airlines, Virgin America with its business class product and other amenities has a larger cost base than Spirit, which puts it in direct competitive fire with legacy carriers, and in some cases makes it more vulnerable than Spirit in some of those high-traffic markets. Virgin America unit costs excluding fuel were USD6.49 cents compared with USD6.05 cents at Spirit. Florida-based Spirit, during its rapid domestic expansion during the last couple of years, has adopted a strategy of entering legacy-dominated markets with low frequency and rock bottom fares to stimulate traffic instead of attempting to steal passengers from the legacy behemoths. Presumably Virgin America’s decision to add only a single aircraft between the end of 2Q2012 and 2Q2013 will result in a freeze in new route expansion, allowing the airline to mature recent additions including Boston, Portland and Philadelphia and focus on competing effectively on its more established routes. The slowdown is meant to assure investors that profitability is within its reach, but after mounting losses and dwindling cash balances, Virgin America’s business case is becoming more difficult to sustain. Its decision to pause its growth may be its only chance to reverse fortunes before investor patience wears out.